Well, I was right. It is very simple. Yet I can't wait to get a copy to take home to the family and teach my wife and daughters. One friend has likened this to Settlers of Catan without the board. I think that is a very apt description. And it is all wrapped up in a very neat visual design that I find appealing. Roll dice, steal from your opponents, produce money from your properties, and build. 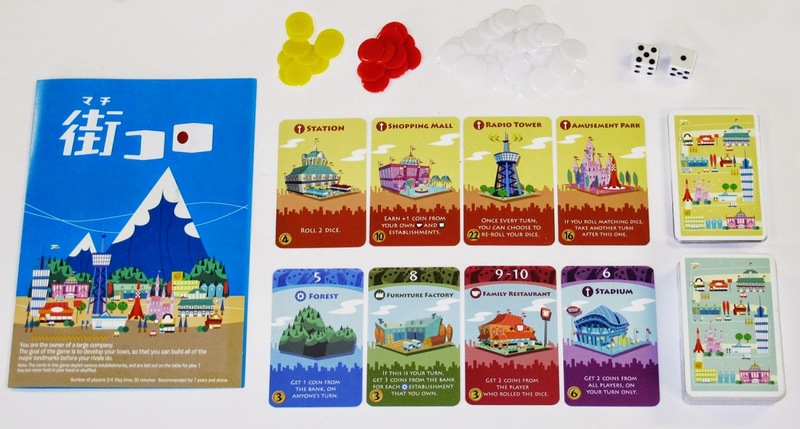 First person to build all four of their major landmarks wins. There it is. That is the core of the game. Okay, there is more. Cards come in four colors, Blue cards produce coins no matter who is rolling the dice. Green cards only produce on your turn. Red cards only trigger on other players turns. Purple cards... well... you just have to read those as they're all different. As the game goes on you keep buying cards in of the different types to build a small economic engine and build your larger landmarks quickly. The upside to the large landmarks is that they aren't just an indicator of how close to winning you are. They also change how you play the game. The smallest of the four, the Train Station, gives you the choice of rolling one or two die on your turn. Your overall gameplay decisions revolve around how you want to get money. Do you take it from other by players by building cafes and restaurants? Do you out-produce other players with wheat, ranches, forests, and mines, all which can trigger on anyone's die roll? Or do you go for a multiple tier strategy using the furniture factory whose value goes up depending on the number of forests you control? In the two hours that we played this game, we managed to get three full games in. All of us tried different strategies to win and I never felt completely blocked out from acting or that terribly behind the other players. The die could be unkind, but it didn't feel so debilitating that I wanted to flip the table over it. Eventually someone does get enough coin together to finish all four buildings, and we had different winners in each game. Thirty to fourty-five minutes per play felt just right. It also didn't feel like I was still ramping up my 'engine' to win once the game finished, as some games like this do. 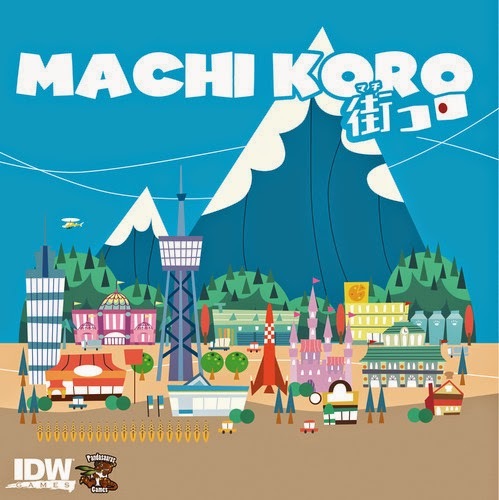 While I am normally a fan of huge and sometimes complex games (Eclipse, Descent 2nd Edition, etc) that can take hours for just one play through, Machi Koro has reminded me that a small game can be deep yet simple. Tom Tjarks is a Fort Worth native and avid game player (PC, Console, Board Games) He has previously written for GamingTrend.com, blogs at his own personal blog, and can be found asking lots of questions about games on Boardgamegeek. He is @tntjarks on twitter, Dreamshadow on Boardgamegeek and other forums.